Centenary 641 was the first of what eventually became a class of eight trams (although at one time was due to ten trams) built by East Lancashire Coachbuilders in Blackburn. One Man Operated the trams were to be introduced on the all year round service helping to keep costs down and relieving the pressure from the OMO Cars which they would ultimately replace. 641 entered service in July 1984 and remained in service until the final year of the traditional tramway in 2011 although use in that last year was sporadic to say the least with a recurring fault keeping it out of action for most of the year. 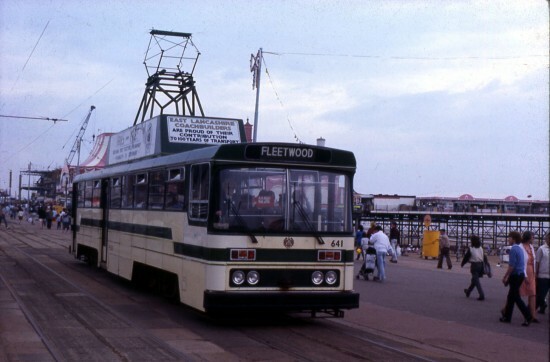 Back to this photo – which would have either been taken in either 1984 or 1986 – 641 is heading through to Fleetwood having just past South Pier. Just beyond South Pier can be seen the framework for the construction of a new inside water park, to be known as the Sandcastle this attraction has now been a distinctive part of Blackpool Prom for over 30 years.